As the weather hints at warmer days to come we see an increase in camping enthusiasts collecting their gear from storage. It’s time to prepare for the season by checking through equipment, replacing anything that’s damaged and trying out the latest outdoor gadgets. As experienced campers will tell you, once you fall in love with holidaying under canvas, you’ll be adding to your camping must-haves every year. 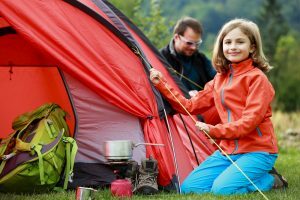 However, if you’re new to camping it doesn’t have to cost a fortune in gear to get started. We’ve put together a few of the essentials for a weekend trip to get you snoozing under the stars in comfort. There are so many options on the market that choosing the perfect tent can feel overwhelming. You do need to research tent reviews online, speak to dealers and visit local camping shops to see some on display. However, you don’t have to pick one straight away. If you can, borrow a tent first to get a feel for the features you like. Plus it’s a good way to be sure camping is right for you anyway. You’ll find that most regular campers have been through a number of tents before settling on a manufacturer and layout they prefer. If you don’t get a good night’s sleep you will never enjoy camping to its fullest. You need to be comfortable and warm – there’s nothing worse than waking up cold or damp. Remember that throughout the night temperatures fall and the ground gets cold. Insulating your bed from the floor helps keep you cosy. Place a picnic blanket under your bed, or use foam mats. Then, choose between an inflatable airbed, a camping bed or a SIM (self-inflating mattress). Each type of bed has pros and cons. Airbeds can be very comfortable, but are prone to deflate. They can also be cold as the air inside cools, so you’ll need a blanket between your sleeping bag and the bed. Camping beds can be quick and easy to erect, but quite restrictive on space and quite firm, while a SIM can be comfortable, if you’re prepared to pay more for one thick enough to keep you from feeling the hard ground. Laying your SIM on top of a camping bed is a great alternative, but costs more in equipment. The final ingredient to a good nights sleep is a thick sleeping bag, wide enough to allow movement, or if you prefer, a large, warm duvet. Take a couple of extra blankets in case you need them. All that fresh air helps you build up a healthy appetite so remember to take your cooker. A simple portable gas cooker is fine, and most come in their own carry case. Don’t forget the gas. Then you’ll need cookware – a saucepan and frying pan, a kettle, plates, cutlery and a large mug for your morning cuppa. Unfortunately camping holidays do mean you have to do your own washing up, so a bowl, tea towel and washing up liquid. As well as food – most camping trips involve a proper English breakfast – you need a cool box to keep your milk and bacon in. One of the best things about camping is settling down by the campfire (if you are allowed one on site). A portable firepit is a lovely luxury – don’t forget the wood. Lightweight folding chairs and a table are perfect for an evening playing cards, and you’ll need a some powerful camping lanterns for light to play by. 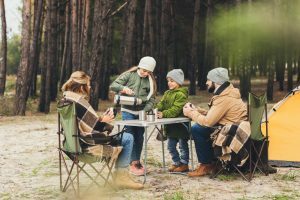 Finally, make sure you pack some warm clothing, a change of shoes in case you get wet – well, we are talking camping in Britain – and your bathroom essentials. And one more thing – don’t forget the bottle opener for the wine, to toast the success of your first trip.